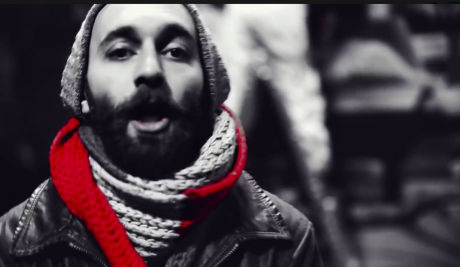 Jamal Ali, Azerbaijani rapper and journalist. Photo/Image Still via MeydanTV / YouTube. Some rights reserved.“I felt like trash,” says Jamal Ali. Last month Ali, a rapper and producer for Azerbaijani independent media outlet MeydanTV, was denied entry to Georgia. He flew back to Berlin, perplexed. MeydanTV has few friends in authoritarian Azerbaijan, where many of its writers and editors have been harassed and imprisoned by the authorities. Ali is just one example: after performing at an opposition rally in 2012, he was sent to prison for ten days, where he was tortured. Upon release, Ali fled to Germany. He’s lived there ever since, while his family remain in Azerbaijan, where they face reprisals from the authorities. Ali’s experience at the Georgian border was unexpected — several of his colleagues live and work in the Georgian capital. In fact, over the past two decades, Tbilisi has become something of an oasis for Azerbaijani activists and independent journalists seeking safety. And after Ali’s run-in with the Georgian authorities, they’ve started to wonder whether the stakes are getting higher. Azerbaijani dissidents suspect that Ali’s detention at Tbilisi airport was orchestrated by the Azerbaijani authorities, though they probably expected a little more from their Georgian partners. In an article published recently by pro-regime website Haqqin.az, Eynulla Fatullayev, a former prisoner of conscience turned pro-government journalist, criticised the Georgian authorities for not extraditing Ali back to Baku, Azerbaijan’s capital. Fatullayev also condemned Georgia for creating the conditions for an “anti-Azerbaijani nucleus" to flourish in the heart of Tbilisi. Azerbaijani oppositionists, he concluded, were uniting in Georgia to overthrow his country’s ruling government. Eynulla Fatullaev's accusatory text identifies leading exiles as members of a shadowy "anti-Azerbaijani cell" abroad. Source: Haqqin.az. Given Azerbaijan’s autocratic neighbourhood — the country borders Iran, Russia and Armenia (with which Baku is still technically at war) — Georgia is the obvious destination for people in Ali’s situation. Azerbaijanis enjoy visa-free travel to Georgia. They’re even able to stay there for 12 months. Economic and cultural links between the two South Caucasus states are booming, and the journey between Baku and Tbilisi isn’t so arduous. Indeed, Georgia has a long history of openness towards Azerbaijanis who are unwelcome at home. It was in Tbilisi, not Baku, where Azerbaijani dissident intellectuals declared the independence of the Azerbaijan Democratic Republic on 28 May 1918. After the Soviet Union collapsed and the Caucasus region descended into conflict, Tbilisi again became an oasis for Azerbaijani dissidents, who fled to Georgia in two waves as an authoritarian regime took power in Baku. The first came after October 2003, when Ilham Aliyev followed his late father Heydar in becoming president, following an election widely regarded as fraudulent. 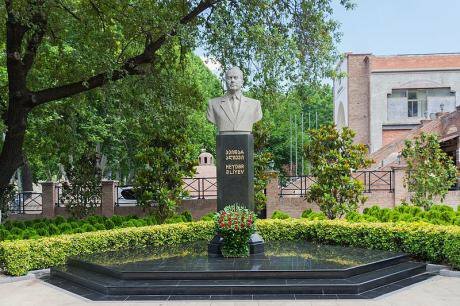 A bust of Heydar Aliyev, former leader of Azerbaijan (and father of ruling president Ilham Aliyev) near Old Tbilisi. Photo CC-by-SA-4.0: Marcin Konsek / Wikimedia Commons. Some rights reserved.The aftermath of this sham vote saw a wave of politically-motivated arrests, further prompting Azerbaijanis to flee west — they assumed they could breathe more easily in a place like Georgia. This coincided with Georgia’s democratic reforms after the Rose Revolution of 2003, which saw pro-western, reformist president Mikheil Saakashvili come to power. Saakashvili’s rebranding of Georgia appealed to desperate Azerbaijani dissidents, and young intellectuals such as novelist Seymur Baycan, journalist Gunel Movlud and composer Elmir Mirzoyev packed their bags and relocated there. The second wave started in March 2013, a month which saw an intense crackdown on dissent in Azerbaijan. Repressions began after the non-parliamentary opposition held rallies in January and March under the slogan “Stop Killing Our Soldiers”, in reference to the non-combat deaths of Azerbaijani conscripts. The rally reflected the pent-up rage of ordinary people, and grew into the largest such event since 2005, when thousands of people took to the streets to protest rigged parliamentary elections. After these scenes, the authorities soon banned all opposition rallies. In response, Azerbaijan’s authorities detained dozens of young activists, including members of the N!DA movement. Again, some of them headed to Georgia, and to safety. Most agree that the unprecedented pressure from the Azerbaijani government on dissidents in Georgia began in late 2014. This was likely the result of an influx of oil money, prompting the overconfident authorities in Azerbaijan to behave more boldly. Efgan Mukhtarli, an Azerbaijani journalist who has taken refuge in Georgia, points to the close strategic relationship developed between Ilham Aliyev and Mikheil Saakashvili. After Saakashvili’s defeat in 2012, the opposition Georgian Dream (GD) formed a coalition government. Azerbaijani dissidents felt more secure in moving to Georgia, given that some of GD’s coalition partners were sympathetic to the plight of activists from Azerbaijan’s beleaguered opposition. Azerbaijan's oil and gas fields are powering the country's authoritarian regime — and its reach abroad. (c) Sergei Grits / AP / Press Association Images. All rights reserved.These hopes, however, were unfounded. Bidzina Ivanishvili, the billionaire mastermind behind the Georgian Dream coalition (and accused by some of a pro-Russian orientation), pushed reform plans to one side. Although ahead of its neighbours, the state of democracy and human rights deteriorated under Ivanishvili, and the flourishing economy came first. Naturally, Azerbaijan, with its extensive oil and gas resources, became Georgia’s most important partner. Ali isn’t the only Azerbaijani dissident who has faced difficulties in Georgia. Gulnur Kazimova, a former journalist for Radio Liberty (which was blocked by court order in Azerbaijan earlier this month), had to flee the city of Ganja with her husband and children in December 2014 after receiving a tip-off that the police were coming to arrest her. It’s now three years since Gulnur relocated to Tbilisi, over which time she’s changed flats 11 times after warnings from Tbilisi’s Human Rights House that she and her family were under threat. “After each and every move, we would run into the same security concerns. We were mostly worried for our children,” Kazimova tells me. “Though we later understood that running away was not a solution and that we have to try and not live in fear.” Kazimova has returned to journalism, and now writes about the problems ethnic Azerbaijanis face in Georgia. Embassy of Azerbaijan in Tbilisi, Georgia. Image still via AZERTAC / YouTube. Some rights reserved.Even in Tbilisi, she faces problems. But here it’s the Georgian police who won’t leave Kazimova alone. The most disturbing incident came last May, when a black Toyota car followed Kazimova along a street in Old Tbilisi. Its occupant was photographing Kazimova and her husband. “The surveillance was so obvious that my husband and I took a photo of the car and went straight to the police,” Kazimova says, adding that she knows the Azerbaijani authorities will not relent in their pursuit. The Georgian police launched an investigation into the incident, which lasted for three months. Baku has one major lever of influence over Georgia. It’s called SOCAR, the State Oil Company of the Azerbaijan Republic. Last year, SOCAR increased natural gas supplies to Georgia by 50m cubic metres, in order to further “mutually beneficial cooperation in the future." This April, a new agreement was signed between Tbilisi and Baku that will allow for a supply of 2,347 billion cubic metres of Azeri gas to Georgia. This figure constitutes almost 90% of the 2,457 billion cubic metres of natural gas imported to Georgia in total. This new agreement automatically precludes any potential deal with Gazprom, which is considered by the Georgian opposition and civil society as a threat to the nation’s energy security in the region. According to Georgia’s minister of energy Kakha Kaladze, much of the country’s electricity demand from April onwards is to be provided for with Azerbaijani gas. SOCAR first came to the Georgian market as SOCAR Georgian Petroleum in 2006. From 2007 onwards, SOCAR started to import gas to Georgia and dealt with Georgia’s gas distribution networks by establishing another subsidiary, called SOCAR Georgia Gas. It later constructed a Black Sea terminal and in May 2008 opened a new export terminal on the coast at Kulevi. In other words, SOCAR has established its business in three separate areas and in recent years, SOCAR has even become the largest single taxpayer in Georgia. 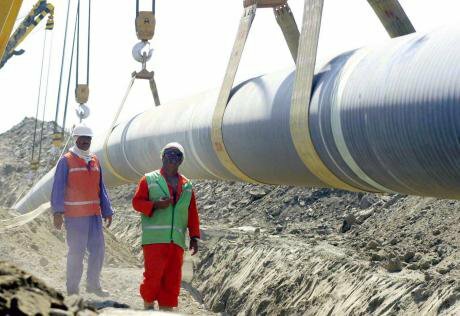 Workers lay a section of the Baku-Tbilisi-Ceyhan (BTC) pipeline in 2006. Photo (c): ABACA/PA Images. 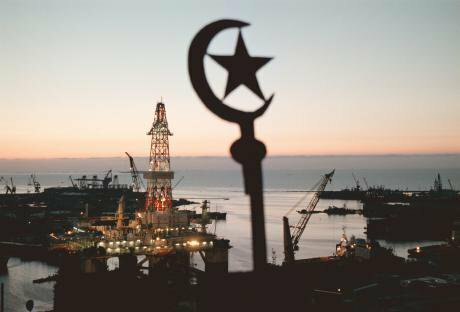 All rights reserved.But SOCAR is more than an energy giant, it’s also a philanthropist, increasing the country’s prestige among the country’s ethnic Azerbaijanis, one of the country’s major minority groups, and Georgians alike. “All of these processes are controlled by the Georgian government," says Zohrab Ismail, an Azerbaijani economist, adding that Tbilisi is eager to win the good graces of foreign investors. This seems to be having a chilling effect on the welcome Georgia has extended to Azerbaijani dissidents in the past. For instance, though the Georgian state did not offer any explanation on the refusal to admit Jamal Ali, it is assumed that his entrance to Georgia was denied due to his professional activities — particularly his latest critical report on how Azerbaijan’s national oil company SOCAR supplied free gas to the churches of Tbilisi. Agalarli was arrested by Interpol while crossing the border from Turkey to Georgia, after an Azerbaijani court found him guilty of tax evasion and issued a call for his arrest on 31 October. Apart from a handful of Middle Eastern countries, Georgia was the only country Agalarli could reach without needing a visa. Mukhtarli suggests that if Agalarli is extradited to Baku, he could face the same fate as Mehman Qalandarov, an Azerbaijani blogger who was found dead in his prison cell on 28 April. Qalandarov, who was in a pre-trial detention in Baku, had fled to Tbilisi in the summer of 2016 and helped organise various protests in Georgia against the Aliyev regime. He returned to Baku because of financial difficulties. “One political dissident who had a Tbilisi past is already dead,” Mukhtarli warns, worrying that anybody listed in the Haqqin.az article written by Fatullayev could be in the same boat. The Georgian Ministry of Foreign Affairs has commented on the claims made in the Haqqin.az article, promising to “study the issue closely” and stressing the close strategic partnership between Baku and Tbilisi. “This is the first time the Georgian government has officially expressed their views about our presence here,” says Mukhtarli. He adds that in previous years, Tbilisi was cautious and preferred communicating with the Azerbaijani dissident community via various non-governmental organisations. 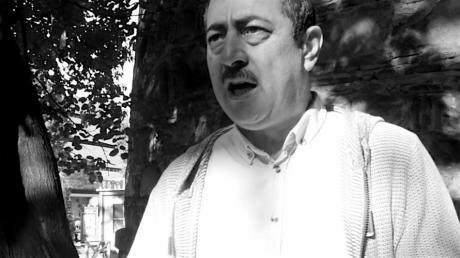 Dashgin Agalarli, an Azerbaijani oppositionist who has been threatened with expulsion from Georgia. Photo courtesy of MeydanTV. Some rights reserved.Natia Tavberidze, the coordinator of Human Rights House in Tbilisi, doesn’t believe that the situation is “critical”. She says her organisation continues to support Azerbaijani activists in exile, and has had no run-ins with Georgian officialdom so far. “The way my spouse was recently questioned in Azerbaijan once again confirmed my suspicions that personal information about human rights activists and journalists is being transferred to the Azerbaijani authorities,” Agalarli says. So far, no Georgian government official has explained exactly what danger Agalarli and Mustafayeva pose to the country’s national security. Both deny carrying out any terrorist activities or attempting to topple any government. “For the second time in our lives, we’re under government pressure. I just can’t understand it,” sighs Agalarli, adding that he regrets seeing Georgia as a safe haven. In Mustafayeva’s words, it feels worse than being jailed. Although Georgia has a visa-free regime with Azerbaijan, administrative registration and residency potentially pose hurdles for those seeking to put down roots in Tbilisi. Enrolling children into a Georgian school, or applying for a visa for a third country, require a residence permit. But some are able to settle, if not always thrive, in Georgia. According to Tbilisi-based Azerbaijani lawyer Emin Aslan, it’s usually not too difficult to get an official residence permit. “Though those who publicly oppose the Azerbaijani government in opposition rallies outside the embassy might run into some problems on Baku’s request,” says Aslan, adding that harassment of activists likely increases as a result of such campaigns. Indeed, the Azerbaijani government does not want to see its neighbour to the west become a hub for its critics. 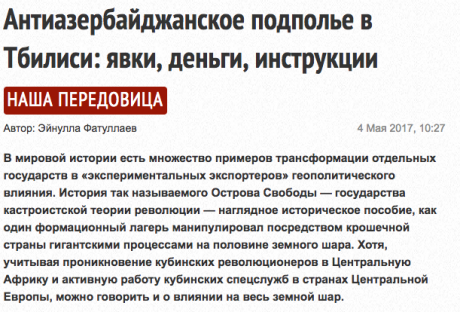 Likewise, the Georgian Dream government wants to keep the good graces of its regional partner and key energy supplier. And perhaps the Georgian authorities, dealing with their own problems of inequality and poverty, want to avoid having more residents to provide for — especially those who may prove a political nuisance. If things heat up in Tbilisi, Azerbaijani dissidents could pack their bags again, using Georgia as a transit point to move to a third country — most likely the Czech Republic or Germany, which both host established communities of Azerbaijani dissidents. Sergey Rumyantsev, a sociologist and expert on Azerbaijani politics based in Berlin, is sure that Baku will keep putting pressure on the Georgian government in the months to come. “Georgian efforts to get rid of their annoying new visitors could be undertaken very delicately, but they’ll still serve the purpose of decreasing the opposition to the Aliyev regime in Georgia,” he concludes. However, Rumyantsev adds that the US embassy and EU probably play a role here, mitigating pressure on Azerbaijani dissidents by calling on Tbilisi to honour its lofty democratic values. After his close shave, Jamal Ali worries that Tbilisi may be betraying those values. As each year passes, the Aliyev regime becomes more vicious in its crackdown on dissidents in Azerbaijan. And given the geopolitical realities of the South Caucasus, there’s no way out for them except via Georgia.